ORGANIC U-PICK PRODUCE GROWN BY A FAMILY THAT LOVES PRODUCE! Our family has been growing quality produce in Central Washington since 1937. We offer an incredible variety of certified organic fruits and vegetables including over 100 varieties of hot and sweet peppers (Ghost pepper and other specialty extra hots), 15+ varieties of tomatoes (including heirloom) , 10+ varieties of melons/watermelon, 10+ varieties of winter squash, eggplant, green beans, juice grapes (Concord and Early Campbell), onions, garlic (we will not have our own garlic for the 2017 season)and much more. We also try to provide conventional onions, apples, potatoes, pears, peaches and nectarines throughout the season when possible (call for availability). So if you are looking for a great family outing, great produce and fresh air, head out to the farm where we work hard to meet all of your fresh produce needs. Free range, grass fed whole beef! Check to Where's the Beef tab! Check out our recipe page for some Krueger Family favorite recipes. Want more of our favorite recipes or looking for a gift for your favorite cook? We have it! Order our cookbook now on our Recipe Tab! Opening August 1st for the 2018 season. 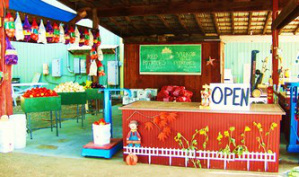 Krueger Pepper Gardens...A family owned farm specializing in U-pick organic peppers and produce. Located in a small central washington town called Wapato, just south of Yakima.